إذا كان يحظر عليك الدخول الى محتوى هذا الموقع الالكتروني و\أو يحظر عليك التداول من خلال هذا الموقع الالكتروني أو كان هناك أي شك فيما إذا كان يسمح لك بالتداول أم لا، عندها يُطلب منك رجاءا أن تخرج من هذا الموقع الالكتروني. المواطنين الأمريكيين لا يسمح لهم بالتسجيل للتداول معXTrade. التسجيل للتداول متوافر فقط للمواطنين الغير أمريكيين. إذا كنت تحمل جنسية أخرى، عندها يمكنك أن تقرر اختيار دولة الجنسية التي تحملها عندما تقوم بالتسجيل. 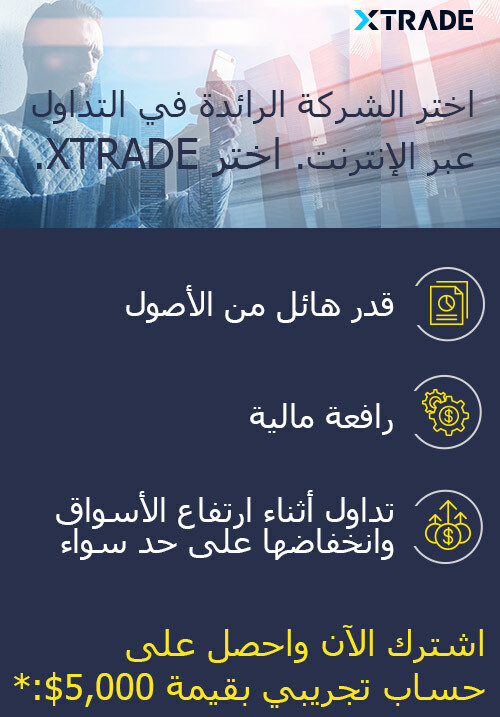 المواطنين الكنديين لا يسمح لهم بالتسجيل للتداول مع XTrade. التسجيل للتداول متوافر فقط للمواطنين الغير كنديين. إذا كان يحظر عليك الدخول الى محتوى هذا الموقع الالكتروني وأو يحظر عليك التداول من خلال هذا الموقع الالكتروني أو كان هناك أي شك فيما إذا كان يسمح لك بالتداول أم لا، عندها يُطلب منك رجاءا أن تخرج من هذا الموقع الالكتروني. التسجيل في التداول متاح لغير الأفغانيين فقط. التسجيل في التداول متاح لغير الجزائريين فقط. التسجيل في التداول متاح لغير الأنجوليين فقط. التسجيل في التداول متاح لغير الإيرانيين فقط. التسجيل في التداول متاح لغير الإسرائيليين فقط. التسجيل في التداول متاح لغير اليابانيين فقط. التسجيل في التداول متاح لغير الليبيريين فقط. التسجيل في التداول متاح لغير مواطني مونتسيرات فقط. التسجيل في التداول متاح لغير مواطني النيجر فقط. التسجيل في التداول متاح لغير النيجيريين فقط. التسجيل في التداول متاح لغير الكوريين فقط. التسجيل في التداول متاح لغير الفلسطينيين فقط. التسجيل في التداول متاح لغير السوريين فقط. التسجيل في التداول متاح لغير مواطني زائير فقط. By accessing this website you confirm that you are allowed under the regulations and laws of your local jurisdiction to view the content displayed on this website and to trade through XTrade. If you are prohibited from accessing the content on this website and/or are prohibited to trade via this website or if there is any doubt as to whether you are allowed to trade or not, you are kindly requested to exit this website. Belgium Citizens are not permitted to register to trade with XTrade. Registering to trade is available to non-Belgium Citizens only. If you hold another nationality, then you may decide to select the country of your nationality when registering. Singapore Citizens are not permitted to register to trade with XTrade. Registering to trade is available to non-Singapore Citizens only. New-Zealand Citizens are not permitted to register to trade with XTrade. Registering to trade is available to non-New-Zealand Citizens only. Hong-Kong Citizens are not permitted to register to trade with XTrade. Registering to trade is available to non-Hong-Kong Citizens only. Brazilian Citizens are not permitted to register to trade with XTrade. Registering to trade is available to non-Brazil Citizens only. Cypriot Citizens are not permitted to register to trade with XTrade. Registering to trade is available to non-Cyprus Citizens only.  Iraqian Citizens are not permitted to register to trade with XTrade. Registering to trade is available to non-Iraq Citizens only. Lebanonian Citizens are not permitted to register to trade with XTrade. Registering to trade is available to non-Lebanon Citizens only. 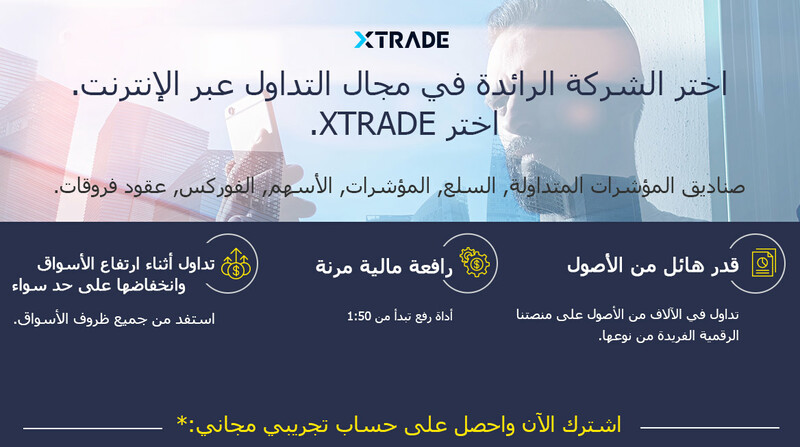 Libya Citizens are not permitted to register to trade with XTrade. Registering to trade is available to non-Libya Citizens only. Myanmar Citizens are not permitted to register to trade with XTrade. Registering to trade is available to non-Myanmar Citizens only. Sudan Citizens are not permitted to register to trade with XTrade. Registering to trade is available to non-Sudan Citizens only. Somalia Citizens are not permitted to register to trade with XTrade. Registering to trade is available to non-Somalia Citizens only. Yemen Citizens are not permitted to register to trade with XTrade. Registering to trade is available to non-Yemen Citizens only. The selected country Citizens are not permitted to register to trade with XTrade. ينطوي تداول العقود مقابل الفروقات CFDs على مخاطر خسارة كبيرة.